The hopeful teaching of this book is that while everybody suffers, most of this suffering is unnecessary�it can be overcome. The legacy of Aristotle is that we think that things must be either true or untrue. Thus we tend to think in terms of polarities: good or evil, right or wrong, Democrat or Republican. 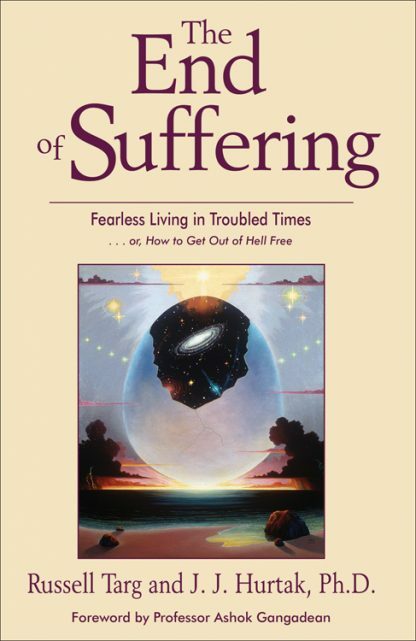 This friend-or-foe approach may seem to make life easier, but Russell Targ and J. J. Hurtak in The End of Suffering, assert that this worldview only increases our experience of suffering. In an effort to overcome the polarity of opposites and the accompanying suffering, Targ and Hurtak combine the wisdom of the East with the finding of quantum physics and uncover a middle ground that shows opposing sides are really the same. Buddha taught us to live a helpful and compassionate life and to surrender our ego to the peace of spaciousness. The middle path of Buddhism shows that things may also be neither true nor not true, or both true and untrue. Remarkably, recent discoveries in modern physics echo these ancient teachings. The End of Suffering puts these perceived opposites�Buddhism and physics�together and shows, step-by-step, how we can learn to surrender the story of who we think we are and experience an end to our suffering. J.J. Hurtak, Ph.D, is a philosopher and futurist with doctoral degrees from the University of California and the University of Minnesota. Dr. Hurtak is an internationally known social scientist and spiritual teacher in both Judeo-Christian and Buddhist traditions. He lives with his wife, Desiree, in California.